Harley-Davidson produces excellent motorcycles and has thumped market returns for decades, but I'm not completely sold on its future growth story. When investors think about automotive companies, they typically think of big names like Ford or General Motors. Perhaps they go so far as to consider automotive parts suppliers such as BorgWarner or dealership groups such as AutoNation. All of those different segments of the automotive industry offer interesting investments, but many investors overlook recreational vehicle companies. Here is a company that produces an excellent product, and has an iconic brand name, that has been on my watchlist for some time: Harley-Davidson (NYSE:HOG). As you can see below, the company has thumped the market with its returns since the mid 1980s, but its future growth story is less certain. One huge benefit investors have when investing in Harley-Davidson is a strong brand image that's over a century old -- few companies can boast that accomplishment. That long-standing image has been critical in building its consumer loyalty, which gives the company an economic moat other motorcycle makers can't soon clone, if ever. Harley dominates the U.S. market for heavyweight motorcycles, with just over 50% market share, which enables the company to achieve greater economies of scale than its competitors. That said, Harley-Davidson has yet to regain pre-recession sales levels. Chart by author. Information source: Harley Davidson Fact Book. Despite sales being lower than they were a decade ago, there's no denying that Harley-Davidson's gross margin of nearly 40% through the first half of 2015 is impressive. That strong gross margin trickled down to a healthy 23% operating margin in its motorcycles segment, which is roughly twice as high as you'll see with traditional OEMs in the standard automotive industry. Chart source: Harley-Davidson's Q2 Presentation. Harley-Davidson offers investors a dominant position in the U.S. market, makes a healthy profit off its motorcycles, and continues to return value to shareholders through dividends and share repurchases. However, the reason the company remains on my watchlist rather than in my portfolio is that the future growth story hasn't sold me yet. To continue thumping the market's returns, Harley-Davidson is going to have to reach new customers and new markets. That's because an increasing proportion of the company's core 35-and-older demographic is moving toward retirement age, which will likely hinder demand for its products in the medium term. 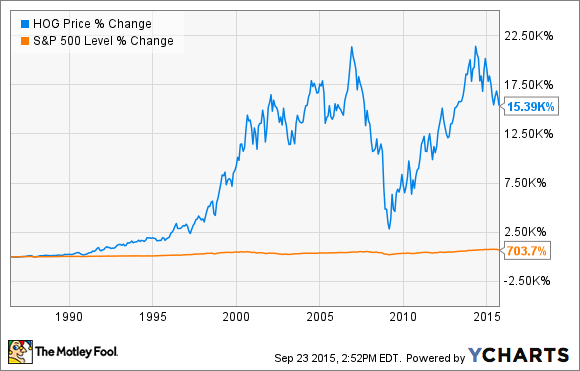 One thing for investors to watch will be the success of Harley-Davidson's Street. It's a motorcycle that's reaching out to a new audience that could help reinvigorate top-line growth, since 70% of U.S. Harley-Davidson Street customers are new to the brand, and that figure reaches 90% in Harley-Davidson's EMEA (Europe, Middle East, Africa) region. At the end of 2014, the U.S. and European markets generated nearly 80% of the company's total annual independent dealer retail sales, but the company needs to improve its footprint in markets such as Japan, Canada, Australia, and Brazil to grow at a pace that would satisfy investors. If Harley-Davidson's Street motorcycle, among other product lines, can generate new demand overseas, and with a younger consumer in the U.S., the company could offer investors market-beating returns on the road ahead.